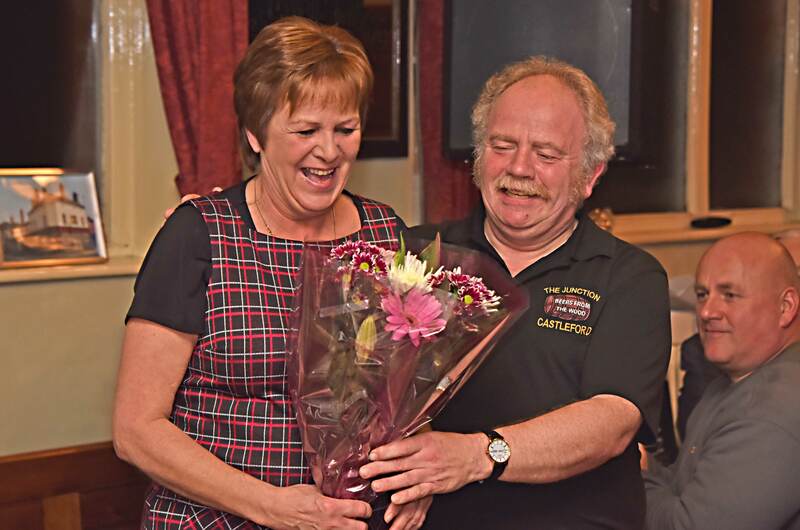 In July 2015, the Junction pub in Castleford now widely known as the ‘home of beers from the wood’ celebrated its fifth anniversary under the stewardship of Maureen Shaw and Neil Midgley, becoming nationally revered as the major player in the revival of wood casks in the beer industry. From early 2014 the pub has served an ever changing range of guest beers from a multitude of brewers only from its own wooden casks, uniquely the only pub in the country and probably the world to do so. 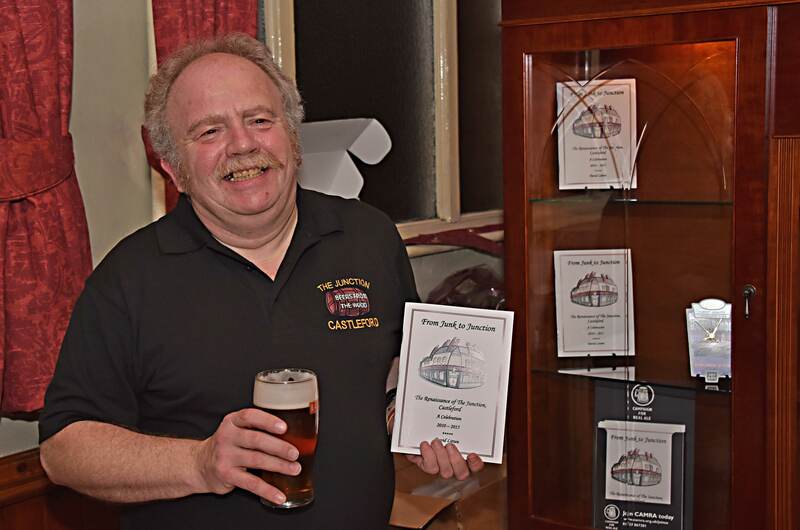 In March of this year I decided that, having previously written many articles for CAMRA magazines, I would attempt to write something rather longer which turned out to be a book about my favourite pub. With the blessing of Maureen and Neil I began to think about how to write it. It was not going to be a straight narrative but something based around topics. A chance meeting in Sheffield with Sophie Atherton, a freelance journalist and beer sommelier (a trained professional who works in the hospitality and alcoholic beverage industry specializing in the service and knowledge of beer) got me under way. She advised me to use plenty of quotes from people to give the personal touch. And that was where the process began. I visited the pub many times during the next few months (as if I needed any excuse) to talk to as many locals as I could. I also interviewed Master Cooper, Alastair Simms and several of the brewers who provide the beer most notably Mike Hiscock from Elland Brewery. 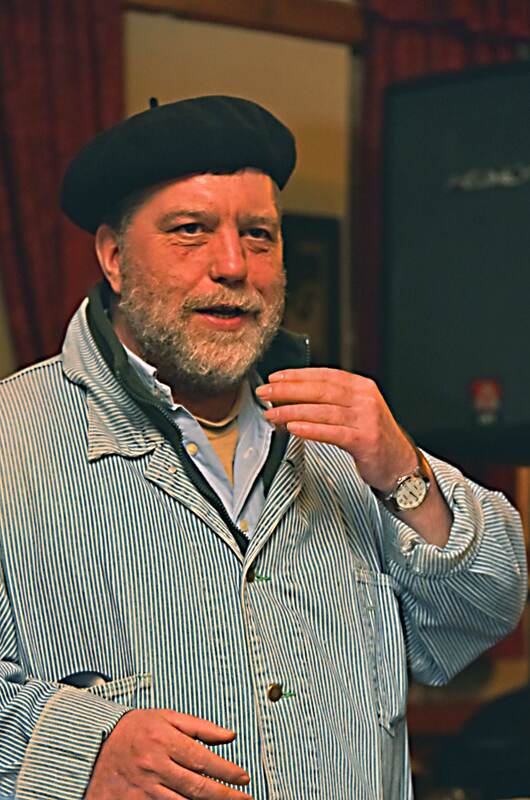 Unfortunately, the brewer who first dared to share the dream of “beer from the wood”, Simon Bolderson (to whom the book is dedicated) from Ridgeside Brewery in Leeds died last year but his wife Sally kindly came to my rescue and valuably provided key information. 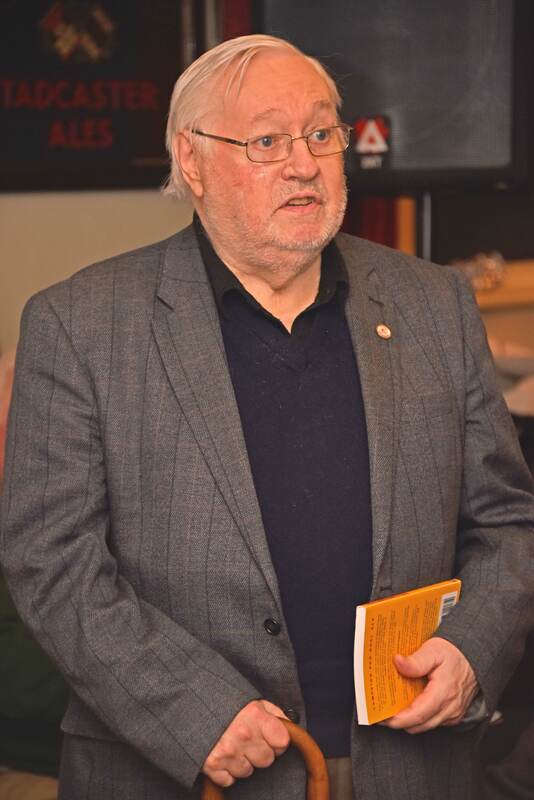 Local broadcaster and writer Ian Clayton not only provided important advice but also supplied a foreword, details of the local beer scene in Castleford prior to the Junction reopening, an anecdote and much more. I also obtained contributions from the Chairman of the Wakefield branch of CAMRA, Albert Bradbury; the Chairman of the West Riding branch of the Society for the Preservation of Beers from the Wood, Ian Cole; and from Bill English from the SPBW National Executive Committee. Not happy with that I asked renowned beer writer and editor of the CAMRA Good Beer Guide, Roger Protz to write a foreword for me knowing that he had visited the pub on a couple of notable occasions. He agreed and by this point I had a vast amount of information. However, by early September I still had no idea how I was going to bring everything together. The only thing was to start writing. Suddenly the light went on and all the chapters began to fall into place. With the project now reaching the reality level the next step was to decide how to find a printer, refine the content, and gather funding. Friends Chris Peat and Rich Jones together with Neil joined me as advisors and the plot thickened! I approached a number of printers for quotes based on around 80 pages and although not the cheapest, but by far the most helpful, I decided to run with local firm Harris Brothers in Featherstone as recommended by Ian Clayton. They advised that the maximum number of pages for assembling by the cheapest method was around 100 so that was now my target. No one has as many photographs connected with the Junction as me and many that I had taken with nothing particular in mind became most relevant. Together with others supplied by Maureen and helpful friends (particularly of the early days), the number of pages grew to around 130 pages. With serious editing I decided to limit the number of photographs to 50 of the best and the target size reduced dramatically. Next up was the proof reading. I had plenty of offers and accepted them all, with perhaps the most careful of the scrutinizers being Richard Coldwell and John Grant Gibson. Meanwhile funding became an issue. Maureen and Neil had selected the Alzheimer’s Society as their chosen charity. Generous friends, breweries and businesses all chipped in and the result was that these contributions almost fully covered the cost of printing enabling most of the sales to go straight to our charity. Good on you folks. Much appreciated. Several proof copies came and went with many changes and even after the last one I still took the risk of making 30 more changes without any outside assistance. With this burden on my mind plans for the launch had to be made. We don’t do things by halves when it comes to the Junction and this was to be no exception. I arranged with Mike at Elland brewery to organize a special beer with a book related name – Codex. Neil sorted out some special rare beers aged in the wood from Cheshire Brewhouse (Govinda) and Kirkstall Brewery (Herzblut). I asked Maureen not to get sandwiches in but to prepare her pièce de résistance – Cas Caviar (if you don’t know what that is, purchase the book or call in at the pub). Noted beer writer Barrie Pepper and local broadcaster Ian Clayton agreed to say something and Rich Jones offered to lead the renditions of the pub anthems accompanied by glorious Colin Williams on the piano. And so to the evening of 26th November 2015. Maureen and Neil had been donated a display case for the pub just a few days earlier and I put it to good use setting out my wares. The lighting inside even worked. I could not have planned it better. Friends, brewers and supporters from CAMRA and SPBW came from all over Yorkshire to add their support to that of the locals – it was unbelievable – Bradford, Doncaster, Halifax, Keighley, Leeds, Selby, Wakefield and all points between. There must have been somewhere between 60 and 80 happy souls in attendance. We drank the beers, made the speeches, sang the songs and ate the snap. Most importantly, quite a few books were sold in aid of the Alzheimer’s Society.